We all love our smartphones and tablets, but boy do we miss our big screens, mice, and keyboards when doing complex work on those mobile devices. That’s why the notion of a smartphone that acts like a PC when connected to those peripherals has kept recurring ever since the iPhone redefined mobility for the modern era. But so far, reality has not delivered on that promise of the mobile-on-desktop notion. Now, Samsung is trying its hand at this puzzle, with the Dex dock available for its [[link to review]]new Galaxy S8 and S8+ smartphones]]. The Motorola Lapdock back in 2011 was the first dock to put smartphone screens on a computer monitor, as well as provide a full-screen browser and connections for physical keyboard, mouse, and other peripherals. But the constrained smartphone apps weren’t much easier to use as big-screen windows, and the Linux-based browser was too limited. Apple took a dockless approach, using its AirPlay protocol to beam an iPhone’s or iPad’s screen to a TV via an Apple TV box and provide typing access via Bluetooth keyboards. That didn’t make the app user interfaces usefully bigger (they were magnified, but contained the same number of pixels as the Apple devices’ own screens). And moving your hand between the physical keyboard and device touchscreen (iOS still has no mouse support) is an awkward experience you do only when required. In effect, Apple’s AirPlay approach is limited to presentation use, and Apple has clearly decided to focus on making the iPad itself work better as a laptop surrogate. Last fall, HP tried its hand at the mobile-on-desktop game with its Elite x3 with Desk Dock, also with unfortunate results. The Elite x3 smartphone is too big and clunky to use as a phone, and although the Desk Dock works decently, the whole thing is undermined by the use of Windows Mobile. People expected to run real Windows applications via the Desk Dock, but they got a few, limited Windows Mobile apps instead. That’s a no-go zone. Samsung has had a dock before, for 2013’s Galaxy Note II and Galaxy S4, but that Samsung Smart Dock wasn’t very smart. It merely projected the mobile device's screen to a TV, like Apple’s AirPlay but via a cable, plus it allowed use of USB input devices. It disappeared quickly and quietly. Now Samsung has the $150 Dex Station, a dock that works only with the Galaxy S8 and S8+. Dex comes the closest yet to delivering on that mobile-on-desktop promise. It requires the S8 series for two reasons: their beefy processor and memory, as well as their USB-C connector. That’s too bad because I dislike the Galaxy S8 [[link to review]] and would love to use Dex with its better predecessor, the Galaxy S7. Oh well. When you plug your Galaxy S8 into the Dex Station that is connected to a monitor, keyboard, and mouse, in a few seconds you get a PC-like desktop screen on your monitor, with a Windows-like system tray containing relevant controls from the Android system tray. Running apps show up in a MacOS-like Dock at the bottom of the screen. You can drag apps from the Android Home screen to the Dex desktop, like putting shortcuts in the Windows or MacOS desktop for easy access. The Samsung Dex Station does a very nice job of creating a desktoplike user experience for Android apps, while retaining mobile-specific Android capabilities and controls. Too bad it works only with the Galaxy S8 and S8+ smartphones. Apps that support both tablet and smartphone layouts open up in computerlike windows, which can be resized as they would on a computer. Microsoft’s Office and Google’s G Suite are among such apps, which means they feel very computerlike when running via Dex. Other, smartphone-only apps—including the Phone app, for making calls—display in smartphone-shaped windows, which you can rotate to use vertically or horizontally. To be clear, you’re running Android apps, not traditional desktop applications. 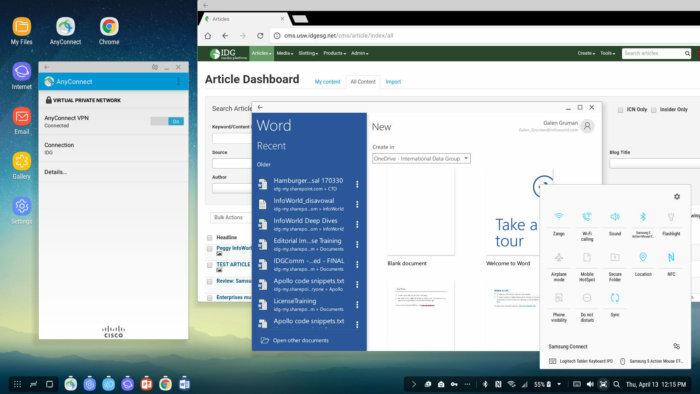 You won’t get the same capabilities for a suite like Office or G Suite via Dex as you would on a PC. But in these two main suites, the Android versions are good enough for everyday use. Because you know you’re running Android, you won’t experience the disappointment that Windows Mobile users get when running the lightweight Windows Mobile apps in what seemed to be “real” Windows. If you need real Windows apps, you can always run them using a VDI client on the Galaxy S8; although VDI is expensive to implement on the back end and awkward on mobile devices, Android (like iOS) has long supported such apps. They’ll be more usable on Dex’s larger screen and with a physical keyboard and mouse. You could of course run apps like Office or G Suite on an Android tablet to get a more desktoplike user experience without having a dock in the middle and even connect to a large screen via HDMI or Google Cast screencasting. But Dex Station gives you not only a larger screen but a more detailed one—your windows hold more pixels with Dex than the blown-up screens do via direct external display from your Galaxy S8. Dex nicely integrates the Android mobile interface elements with the more desktoplike elements it creates for you. As much as I like the Dex software experience, I don’t like its hardware experience. Samsung made a few poor design decisions that keep the Dex Station from achieving a five-star rating. First, the setup process is nightmarish. 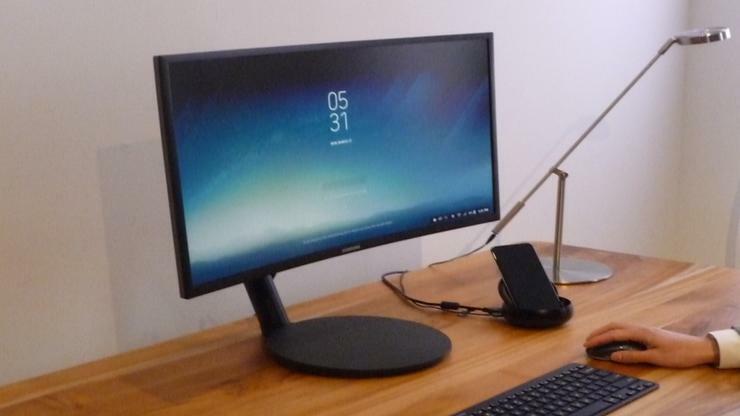 You would think all you have to do is plug the Galaxy S8 smartphone into the Dex Station, then connect the Dex Station to your monitor via HDMI. Nope. First, be careful with the HDMI connections. The cable can appear to be fully inserted in the Dex Station when it isn't. If the cable isn't seated, your monitor won’t detect the Dex Station’s video signal, and your smartphone will beep incessantly to warn you something is wrong. But it won’t tell you what is wrong; there’s no textual alert or way to view one. Also, you must set up all peripherals before you connect the smartphone to the Dex Station, because you need to have the keyboard and mouse up and running to do anything via Dex. If you’re using Bluetooth peripherals, note that you cannot set them up once the Galaxy S8 is docked to the Dex Station. In a really dumb move, Samsung disables the Galaxy S8’s screen and touch interface when it is docked, so you can’t use it to do any forgotten setup or even check status if something is not right. Contrast that to HP’s approach in the Elite x3, where the smartphone itself acts as a peripheral, in addition to whatever other input devices you have set up. The Elite x3 can also continue to function as a smartphone in its Desk Dock. By contrast, once your Galaxy S8 is docked in the Dex Station, you can only use it via the external keyboard and mouse. At least the fingerprint sensor still works when the Galaxy S8 is docked, if you can reach it. There are more poor hardware design decisions in the Dex Station. The circular dock is pretty lightweight, so your cables’ weight and tension can rotate it. Because you can’t use the smartphone itself when docked, that’s not a disaster. But it is annoying, and it can prevent easy access to the fingerprint sensor. Also, the USB-C power cable that comes with the Dex Station is much too short; there’s no way it will reach a wall outlet. It could reach a free USB port on a laptop on your desk, but if you have a laptop at your desk you don’t really need a Dex Station, do you? Prepare to put a charging USB hub on your desk or get a much longer USB-C cable. I also found it awkward at first to use a Bluetooth mouse with Dex. I tried both Samsung’s S Action Mouse and Apple’s Magic Mouse. Both moved much too fast, often jerkily, so it's difficult to select items, click buttons, and so forth. Android provides no controls over mouse speed, as MacOS and Windows do. Fortunately, Samsung provides a way to modify the pointer speed, but it’s not so easy to find. The secret is you go to the Settings app from the Dex desktop; you’ll see a new Settings option called Samsung Dex that appears only when the Galaxy S8 is running Dex; go there to change the pointer speed from the way-too-fast Medium setting to something slower. The Dex Station’s hardware is clever in one respect: Its top flips down to become a back for the Galaxy S8, which plugs into a USB-C connector with the dock. This approach allows the Dex Station to accommodate the disparate sizes of the two Galaxy S8 models. A better hardware design would make the Dex Station a truly great mobile-on-desktop dock. Even with these flaws, the Dex Station finally delivers on the promise that the Motorola Lapdock first made.